I am interested in studying dentistry in future graduate studies, and have always wanted to learn more about the topics it has to offer. After taking a class focusing on neurons, it made me curious as to how the sensory abilities of teeth play out. I was surprised to read online a specific type of cell is involved with tooth sensitivity, and delved into research articles from there. I also wanted to highlight the future implications these studies help shed light on, such that future research will help clarify our understanding on topics like this. 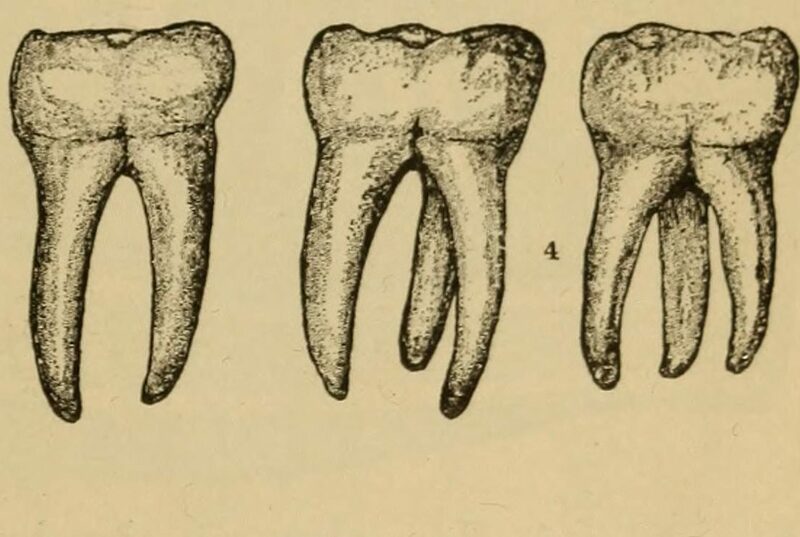 Odontoblasts are cells found within sites of tooth development during the entire human lifespan. Their counterpart, odontoclasts, are involved in absorption of deciduous teeth during normal development (Dixon et al. 2000). The primary function of odontoblasts is dentinogenesis, although an important secondary role involved in sensation is highly implicated. This is supported by Brännström’s hydrodynamic theory of tooth sensitivity, the leading theory on how odontoblasts are involved in sensory perception (Black et al. 2014). The theory suggests a signal transduction process, where changes in dentinal fluid from the external environment can stimulate the odontoblasts near the pulpal end of the dentinal tubule, leading their afferent myelinated A fibers to send sensory signals through the trigeminal nerve to the brain (Brännström 1966). More recent studies have examined the specific molecules and channels involved behind the odontoblast and its initiation of action potentials (Ikeda et al. 2017). These studies, which will be examined as follows, have clarified roles of the molecules involved with odontoblasts. Many of these studies support Brännström’s hydrodynamic theory and highlight the advantages of further research. 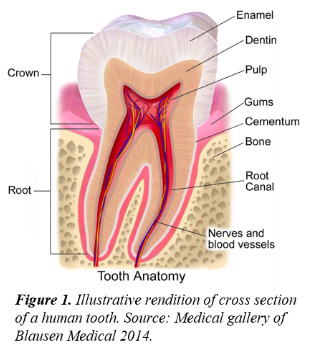 Each of a human’s regular thirty-two teeth are anatomically divided into two main parts – the root, which consists of the lower part of the tooth surrounded by bone, and the crown, which is superior to the root and surrounded by gums. A layer of enamel covers the anatomical crown of the tooth, while cementum covers the anatomical root of the tooth. Underneath the enamel and cementum is dentin, a calcified tissue that surrounds the inner center pulp, as shown in Figure 1. It has been well-documented that a major role of odontoblasts is dentinogenesis, the formation of dentin (Bleicher 2014). Specifically, oligopotent neural crest stem cells give rise to odontoblasts. 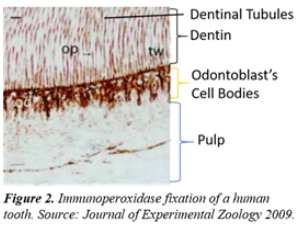 After the odontoblasts mature, their cell bodies remain in the pulp’s outer wall, forming a boundary between the dentin and pulp, as shown in Figure 2. Located within the dentin are dentinal tubules, which extend from the outer pulp wall to the border of cementum or enamel. Due to the microscopic nature of these structures, their exact functions have remained unclear in past studies. It is now known that unmyelinated C sensory nerve fibers surround odontoblasts’ cell bodies while myelinated A fibers surround their processes, and that odontoblasts’ processes enter dentinal tubules (Bleicher et al. 2009). This unique position allows for odontoblasts to not only sense external stimuli, but also transient changes inside the pulp. Dentinal fluid inside the dentinal tubules allows for detection of movement. Although it has been difficult to properly examine, previous research indicates dentinal fluid has an elevated concentration of potassium compared to control serum (Bleicher et al. 2009). The association of nerves with odontoblasts has since been highly documented. Trigeminal nerve fibers form the sensory axonal network around odontoblasts (Bleicher et al. 2009). Primary cilium, an organelle involved in sensory transduction, has been regularly identified throughout human odontoblasts, although the specific mechanistic roles are still being researched (Bleicher et al. 2009). One hypothesis suggests that odontoblasts’ cilia in the cell bodies sense pulp microenvironment (Bleicher et al. 2009). Taken together, these data support the secondary role odontoblasts have as mechano-sensory receptors through axonal signal transduction pathways. Voltage-gated sodium, potassium, and chloride-selective channels have been documented in the odontoblast membrane, suggesting a possible role in action potentials in odontoblasts. In addition to the typical cell membrane channels, KCa and TREK-1 – two major mechano-sensitive ion channels – have been highlighted in odontoblasts (Bleicher et al. 2009). Calcium-activated potassium channels in odontoblasts have been suggested to play a role in mechano-sensitivity detection when the channels activated in response to membrane stretch, revealing a potential mechanism for transducing mechanical stimulus into electrical signals (Bleicher et al. 2009). While the exact mechanism behind the signal transduction has not been uncovered, one theory suggests that an increase of intracellular calcium due to mechanical stretch on the tooth could open odontoblasts’ KCa channels and cause depolarization at their nerve endings (Bleicher et al. 2009). This theory is supported by a previous study that induced tooth pain sensation after inserting potassium agents into dentinal cavities (Markowitz and Pashley 2008). Another study suggests an elaborate ATP-mediated signaling pathway is potentially at work, where metabotropic and ionotropic ATP receptors were found in odontoblasts (Chung et al. 2016). ATP-induced calcium currents caused activation of ionotropic and metabotropic ATP receptors, which provided a basis for sensory processing and suggested the possibility of secondary messenger involvement (Chung et al. 2016). The precise physiological role of the ATP receptors in relation to the KCa channels remains unclear. Another major mechano-sensitive channel seen in odontoblasts are the TREK-1 potassium channels. These channels are open at resting membrane potential and gated by various stimuli such as stretch, heat, and changes in pH. These channels are more concentrated towards the coronal portion of the dentinal tubule and less common towards the pulpal region (Bleicher et al. 2009). This specific distribution inside the dentinal tubule suggests a highly regulated mechanism behind the signal transduction and potentially different levels of regulation. Several lines of research found transient receptor potential (TRP) channels to also be involved in the signal transduction pathway. TRP channels regulate the entry of ions like calcium, which in turn regulates sensory functions in odontoblasts. Ichinohe et al. found that TRPV1, TRPV2, and TRPV4 (channels of the TRP subfamily) functioned in the transduction of mechanical and osmotic stimuli, while TRPM8 was not active in this process (2013). It should be noted, however, that these results were only found on mouse odontoblasts. In a recent study performed on freshly isolated native human odontoblasts, Ikeda et al. found that TRPM8 (transient receptor potential melastatin 8) plays a role in detecting external cold stimulation (2017). This finding highlights the important principle that data from non-human models may not be representative of normal human model function. Although human models are ideal to uncover the mechanisms behind the signal transduction pathway, a few other key discoveries have been made through Black et al.’s study on narwhal’s odontoblasts (2014). As mentioned earlier, the microscopic nature of the dentinal tubules has made it difficult to uncover the molecules at play. As such, narwhals with large tusks measuring anywhere between 1.5 to 3.1 meters on average have offered more complete imaging of the dentinal tubule network (Black et al. 2014). As discussed earlier, it is known that both myelinated A fibers and unmyelinated C sensory fibers are found around the odontoblasts, organized in different layers (Black et al. 2014). A unique characteristic of the C fibers is that they contain Substance P, a neuropeptide that coexists with glutamate in primary afferents and is ultimately involved in pain perception (Black et al. 2014). Immunohistochemical studies in narwhals found localization of substance P largely restricted to odontoblasts’ cell bodies and processes in the dentinal tubules, suggesting a potential role in promoting excitatory impulses and action potentials to the CNS (Black et al. 2014). It should be noted that narwhal’s dentinal tubules are open to the environment, unlike human enamel, which occludes the dentinal tubules. As such, the mechanistic properties of odontoblasts in narwhals may differ, although the confirmation and localization of Substance P in narwhals are useful for future human-model studies. Recent cutting-edge research suggests aspirin could have restorative effects on tooth decay. The method behind this research involves increasing the expression of odontoblast genes, ultimately enhancing the odontoblasts’ ability to make dentin (Du et al. 2017). Aspirin not only promotes dentin formation, but also inhibits inflammation (Du et al. 2017). Since tooth decay yields significant financial costs through requiring additional dental treatments, this finding has significant implications worldwide through financial aspects and providing alternatives to current treatments. Low power laser therapy is a recent innovative approach designed to regenerate dentin. The concept behind this involves laser activated transforming growth factor-β1 (TGF-β1), which differentiates neural crest cells into odontoblasts, promoting dentinogenesis and possibly mechano-sensory abilities (Arany et al. 2014). The implications behind the effects laser activated TGF-β1could have on the odontoblasts’ mechano-sensory abilities are not clear yet. Thus, as we improve our understanding of the structures and ions involved in odontoblasts’ signal transduction pathway, we can better understand how these new treatments interact with odontoblasts and dentin. While significant progress has been made in discovering microstructural elements involved with odontoblasts, greater clarification is needed. A closer look at the precise mechanisms that occur during the signal transduction process is necessary to solidify odontoblasts’ secondary role as mechano-sensory cells. In particular, we now have a greater understanding of the channels at play as well as confirmation of structures, such as Substance P, TREK-1 channels, and primary cilium. Transient Receptor Potential Channels highlight the fact that there may be multiple different signal transduction mechanisms at play dependent on the external stimuli, such as TRPM8, which is specific in detecting external cold stimulation. Brännström’s hydrodynamic theory of tooth sensitivity is supported to this day. Recent potential treatments to dentin regeneration and alleviation of tooth decay demand a greater understanding of the molecular mechanisms involved with odontoblasts as well as other cells in the human tooth. Arany, P., Barcellos-Hoff, M., Chen, A., Cho, A., Hahm, E., Hamblin, M., Huang, G., Hunt, T., Kulkarni, A., Mooney, D., Padwa, B., Shin, K., Sidhu, G., and Weaver, J. 2014. Photoactivation of Endogenous Latent Transforming Growth Factor–β1 Directs Dental Stem Cell Differentiation for Regeneration. Sci Transl Med; 6: 238. Black, S., Dietz, R., Donahue, G., Eichmiller, F., Ferguson, S., Giuseppetti, A., Hauschka, P., Kuo, W., Mead, J., Nweeia, M., Orr, J., Potter, C., Trachtenberg, A., and Watt, C. 2014. Sensory ability in the narwhal tooth organ system. Oral Biology; 297: 599-617. Blausen, B. 2014. Medical gallery of Blausen Medical 2014. WikiJournal of Medicine; 2: 10. Bleicher, F. 2014. Odontoblast physiology. Experimental Cell Research; 325: 65-71. Bleicher, F., Couble, M., Magloire, H., Maurin, J., and Thivichon-Prince, B. 2009. Odontoblast: A Mechano-Sensory Cell. Journal of Experimental Zoology; 312: 416-424. Brännström, M. 1966. Sensitivity of dentine. Oral Surg Oral Med Oral Pathol; 517–526. Chung, G., Jo, H., Jung, S.J., Kim, Y.H., Lee, B.M., Oh, S.B., Park, C.K., and Park, G. 2016. Extracellular ATP Induces Calcium Signaling in Odontoblasts. Journal of Dental Research; 96. Dixon, S., Sims, S., and Weidema, A. 2000. Electrophysiological Characterization of Ion Channels in Osteoclasts Isolated From Human Deciduous Teeth. Elseveir; 27: 5-11. Du, J., Guo, L., Liu, Y., Liu, Y., Mei, S., Su, Y., Wang, H., Wang, S., and Zhao, Z. 2017. Platelet-rich fibrin/aspirin complex promotes alveolar bone regeneration in periodontal defect in rats. Journal of Periodontal Research; 52: 6. Ichinohe, T., Katakura, A., Kuroda, H., Masamura, A., Nishiyama, A., Sato, M., Shibukawa, Y.,Sobhan U., Soya, M., Tazaki, M., and Tsumura, M. 2013. Hypotonic-induced Stretching of Plasma Membrane Activates Transient Receptor Potential Vanilloid Channels and Sodium–Calcium Exchangers in Mouse Odontoblasts. Journal of Endodontics; 39: 779-787. Ikeda, H., Kawashima, N., Okiji, T., and Tazawa, K. 2017. Transient receptor potential melastatin (TRPM) 8 is expressed in freshly isolated native human odontoblasts. Archives of Oral Biology; 75:55-61. Markowitz K., and Pashley DH. 2008. Discovering new treatments for sensitive teeth: the long path from biology to therapy. J Oral Rehabil; 35:300–315.